As the lantern goes around, the blossoms spin around. The clockwork lantern casts moving playful shadows. KARAKURI-TORO appeared on WBS (World Business Satellite) 'TREND TAMAGO'. Movie here. KARAKURI-TORO appeared on TV-Aichi 'NEWS FINE EYE'. Details here. KARAKURI-TORO appeared in Chunichi Newspaper. KARAKURI-TORO was exhibitied at 100%DESIGN TOKYO. The plastic laser-sintering system is a form of additive manufacturing that is often used for RP, rapid prototyping. High power laser fuses successive 0.1mm thick layers of nylon particles into a desired three-dimensional object. 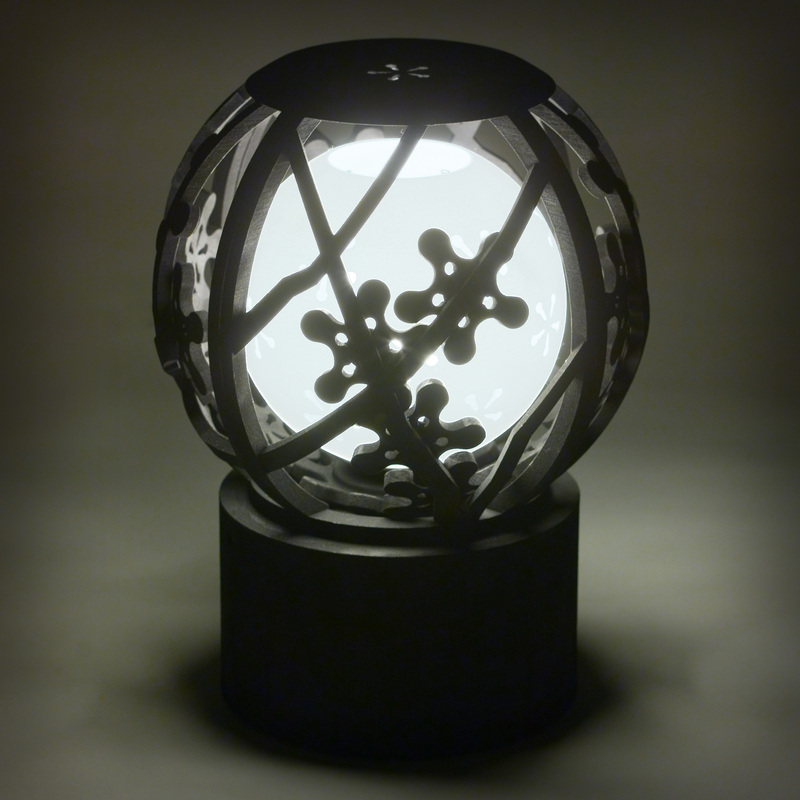 It does not require molds, and is able to precisely produce extremely intricate shapes directly from 3D data. The result is a single build object that excels in durability. 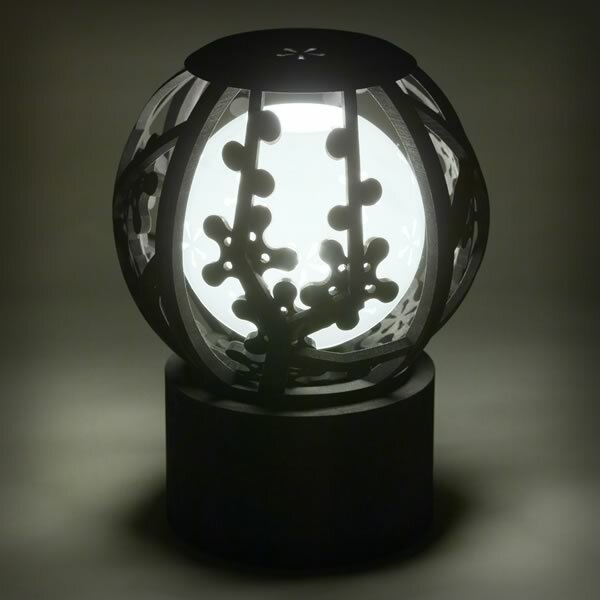 The Clockwork Lantern takes advantage of this single build process, laser-sintering intricately shaped components that had to be built from multiple pieces in conventional methods. Mr. Osamu Nakamura, the master formal kimono dyer in Nagoya, dyed the white 3D-printed nylon object in black. His craftsmanship matured in many years of experience in art of kimono dyeing was fully applied to select the best dye for nylon resin. The marriage of the innovative RP technology and Japanese traditional craftsmanship created new, unique look and texture of the product. Harada Vehicle Design Co. Ltd.
Kota Nezu, Designer and Vision Creator. He was born in Tokyo in 1969. He graduated from Chiba University majored in Industrial Design. After working for the Toyota Motor Corporation, he launched the znug design, inc. in 2005. His work includes the conceptual design and project managing for “i-unit” exhibited at EXPO 2005 AICHI, JAPAN. Currently he produces and designs various industrial products and automobiles. He aims to “znug” (it means “to link” or “to connect“ in Japanese) people through design, and has been showing his design at Milan Salone, 100% Design, etc. 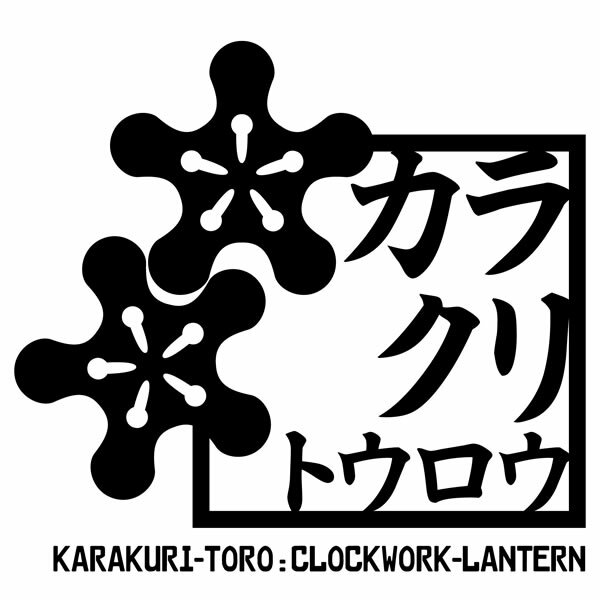 He designed the Clockwork Lantern after being inspired by the laser-sintered gears he saw at the Harada Vehicle Design. (c)2009 HVD + znug design all rights reserved.